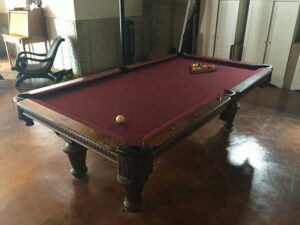 This ultra rare 5’ x 10’ Brunswick-Balke-Collender Centennial pocket billiard table is an original antique pool table (as opposed to a converted snooker table or a carom table, like this one). 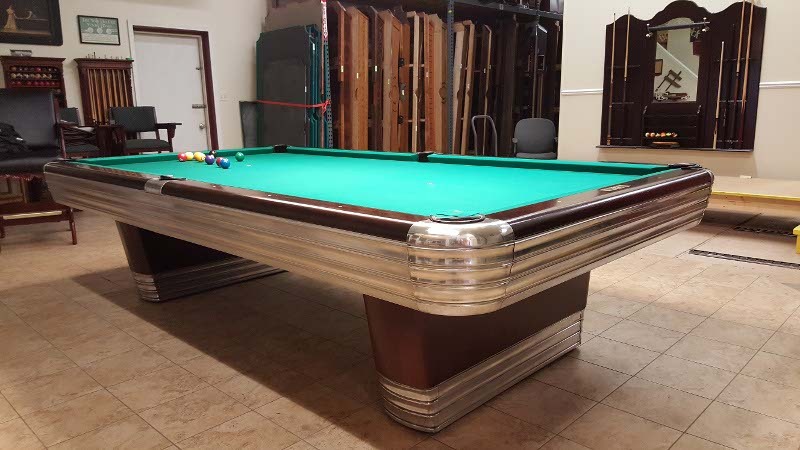 The Centennial integrates both traditional and modern design, with its use of elegant Rosewood finish and the striking, scratch-resistant aluminum castings, aprons, and leg bands. 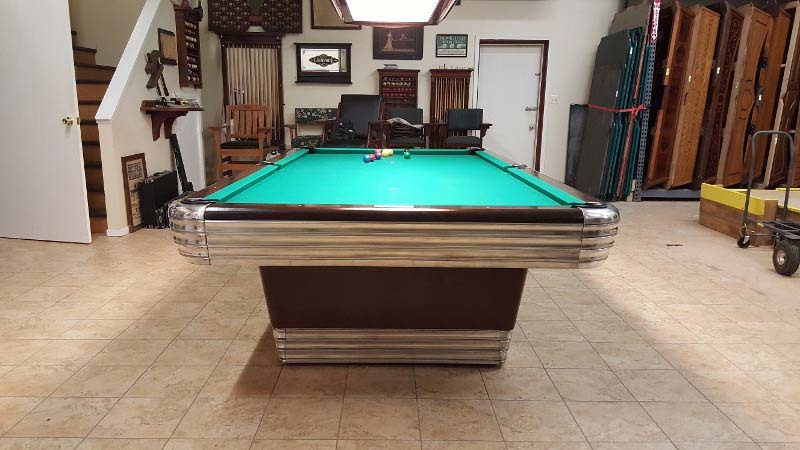 Consistent with contemporary design, this pool table features two oval-shaped plywood legs which are tapered at the ends and covered with aluminum basing to match the aprons and rail castings. 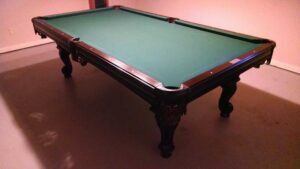 The massive base frame is made up of hardwoods, and consists of two longitudinal stretchers, two horizontal cross stretchers, and two end rails, providing a secure frame for the 3 piece 1” slate top and providing the aprons with stout anchor point. Keeping with uniformity throughout the table, the aprons also feature the grooved and fluted contoured aluminum. 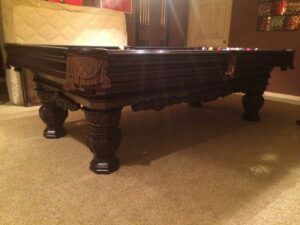 The rails of the Centennial are Rosewood faced, fitted with Brunswick’s famous live rubber cushions, and enveloped in premium cushion cloth for a flawless appearance and accurate rebound during game play. The rounded contour of the rails are topped with Mother of Pearl sights and distinct aluminum castings which are shaped around each of the six pockets. Overall, this massive pool table exudes strength and stability, while reflecting the superior results of over 100 years of leading Brunswick engineering and design. 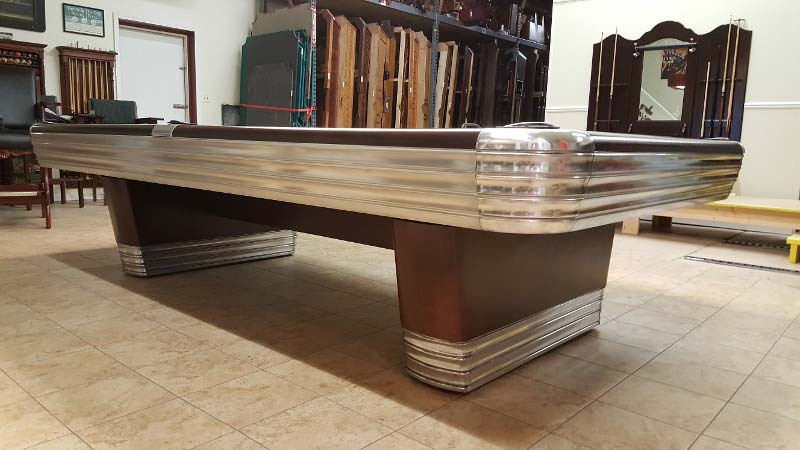 This 10’ Brunswick-Balke-Collender Centennial pool table has been fully restored, both structurally and cosmetically (with polished aluminum castings, aprons, and leg bands), and is ready for its new home! 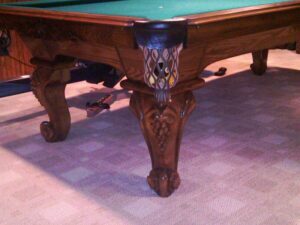 Give us a call for more information or pricing on this gem of a pool table!